A really great experience, I loved being able to interact with it live and ask questions which were answered as we went along, all from the comfort of my own couch! 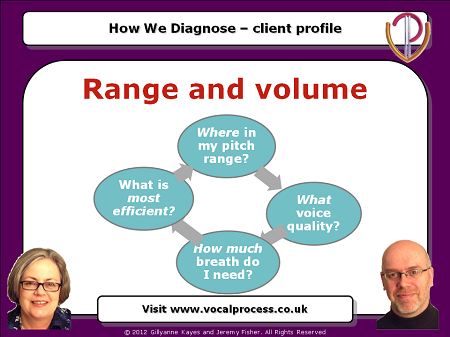 Want to be able to diagnose vocal problems within seconds? Want to be more efficient with a higher professional profile? To be a really effective singing teacher you have to be able to diagnose vocal problems really fast. If you can identify exactly where the problems lie, you can target your knowledge and techniques to that problem so the singer gets the best possible result in the least time. We're going to share the vocal diagnosis process that we both use in our teaching to pinpoint problems and solutions. 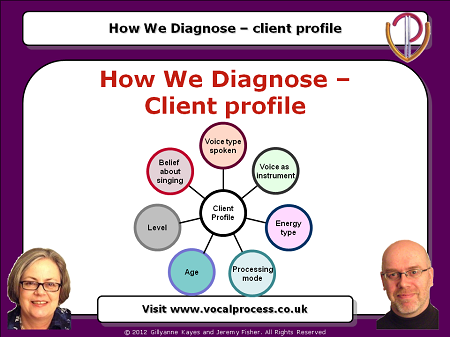 Whenever we work with a new client, we have a number of things that we assess, usually within seconds, that allows us to make accurate and practical diagnosis of vocal faults and skills, and to create a targeted work schedule for one lesson or a dozen. 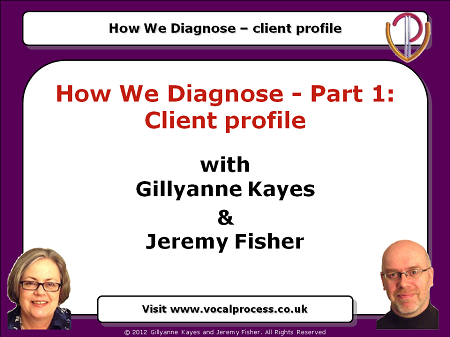 In the first of two webinars on diagnosis, we examine the client's profile, what sort of person, what sort of mind, what sort of voice. We share the seven categories we consider about the client and exactly why they are important in making training decisions. Your purchase price includes our extensive Handout of techniques, hints and tips, and full access to the streaming Webinar video. You can pause, rewind and repeat the online video as many times as you like for the perfect learning experience. As soon as your Webinar order goes through, you’ll get an email with confirmation of your purchase. We'll send you the PDF Handout directly to your email inbox in a time-limited link. Make sure you download it to your hard drive straight away. Watch this webinar to find out our secrets! Copyright Vocal Process. All Rights Reserved.